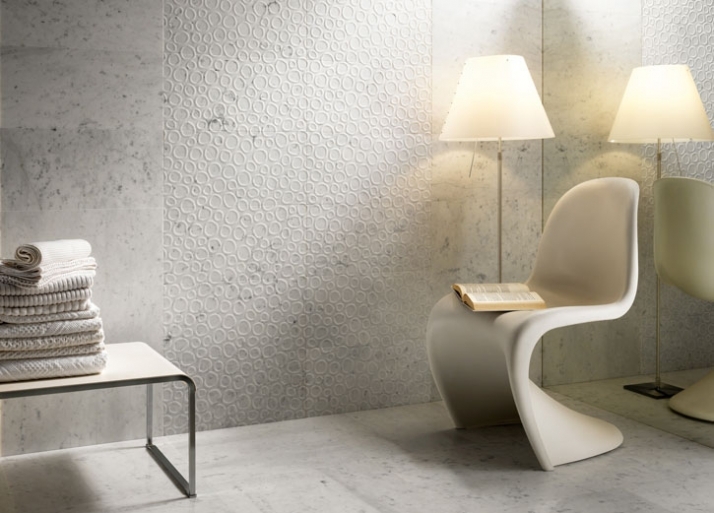 Q-bo is born: the new Italian brand for precious natural and marble stone wall- and floorcoverings, realised with innovative processing and specifically developed equipment and technologies. 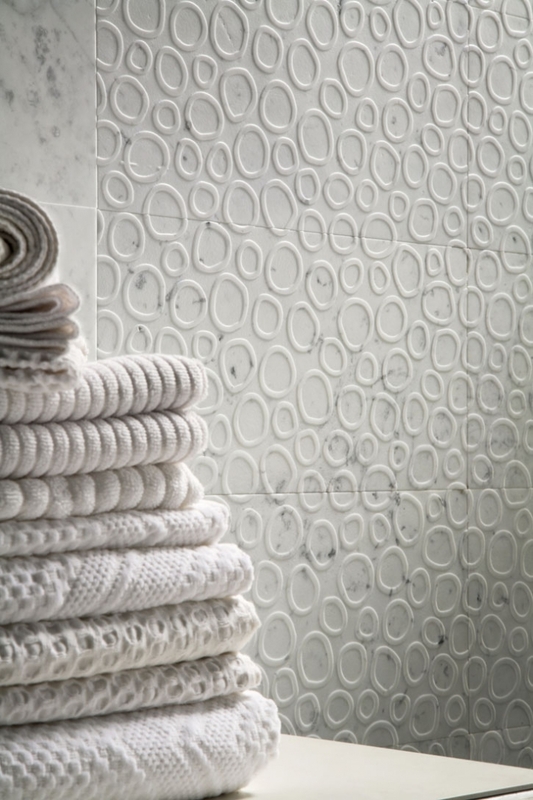 The company has created a new generation of materials reinterpreted with reliefs, design decorations and surface treatments. Q-bo introduces itself by presenting the first line RUGIADA which fully expresses the potential of the company’s products. 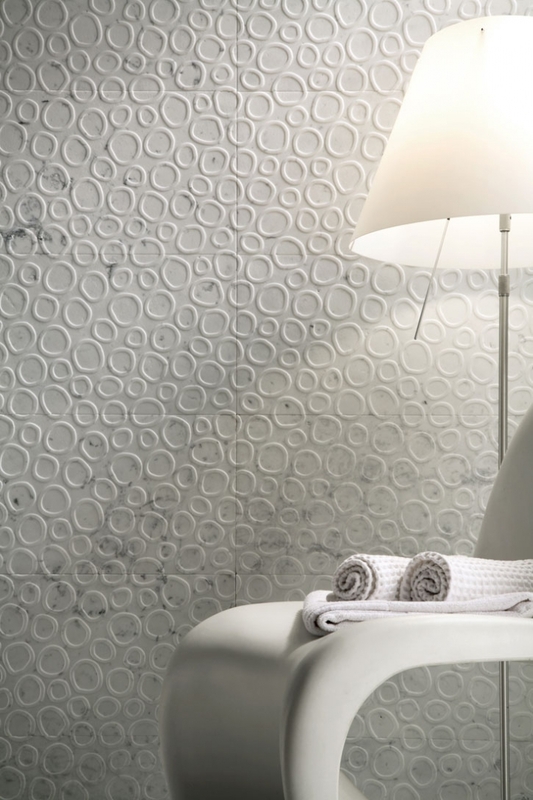 RUGIADA is a resistant and enduring ecological covering, created with selected Italian marbles and stones – Bianco Carrara, Crema Luna and Ardesia Ligure. An exclusive process of sand blasting transforms these precious materials into three-dimensional surfaces of great charm and personality. The 3D surface of RUGIADA (the Italian word for dew) is inspired by the fresh and light water drops that rest, early in the morning, on the leaves of the plants. Irregular rings of different size, spread over the entire surface, create a harmonious and animated texture on the slabs, available in Bianco Carrara, Crema Luna or Ardesia Ligure (anthracite). With its brushed or polished finish, RUGIADA appears either in a smooth look or with interesting light reflexes. As a result of a long experience in the application of sanding processes to various materials, Q-bo has applied exclusive sand blasting processes and specifically developed equipment for the realisation of the surface of RUGIADA. The outcome is a valuable natural covering characterized by high precision surface treatments and substantial design, ideal for unique floor and wall coverings of private homes or contract environments, in- and outdoor application, in big or small spaces. Q-bo is a new generation of natural materials as the result of its founders’ long experience in sanding in low relief on ceramics, natural stone, glass and wood. 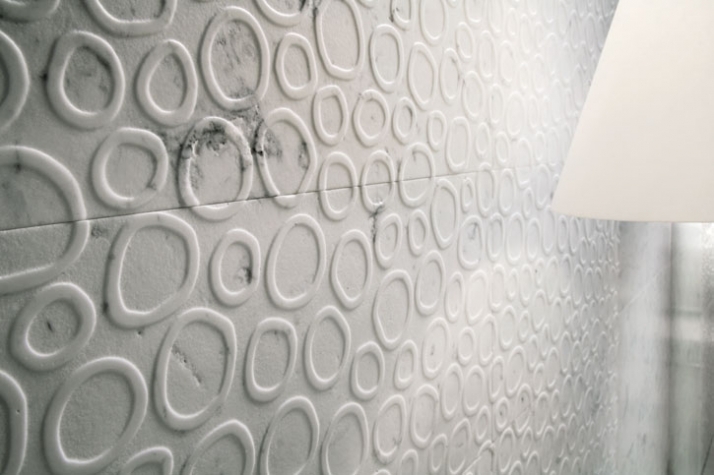 Thanks to avant-garde technologies and specifically developed exclusive equipment, Q-bo produces wall- and floorcoverings in natural stone and marble, with reliefs, shapes and design decorations. Carefully selected in the best Italian quarries and elaborated through sanding, decoration techniques and surface treatments, the top quality marbles and stones - Bianco Carrara, Crema Toscana e Ardesia Ligure – transform into a new concept of surfaces. An innovative and high quality product as a banner of naturalness, pleasant touch and high aesthetic quality.